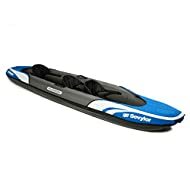 Do something completely different this summer- get outside and take part in the thrilling sport of Kayaking with this Hydro-Force One-Man Wave Line Kayak by Bestway. 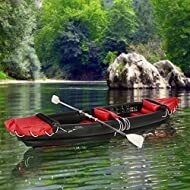 Constructed of high quality pre-tested vinyl and featuring safety valves, grab rope with built in grommets, quick inflation valves and advanced anti-leak technology, this kayak will take you through the roughest waters and back in complete comfort. Complete with oars and a heavy duty repair patch, this is everything you need to get started! The Boat is designed for ONE PERSON weighing up to 220 pounds (100 kg).